I don’t know about you, but I fell into a winter dating slump. This past winter was dubbed with the bonkers phrase “polar vortex” — not exactly conducive to dating. I was so admittedly content living in PINK sweats and leggings and giant, fuzzy sweaters, hanging out with Jack, and watching movies. Sidewalk Brunch. Ditch stuffy restaurants this season and head to a place that has city (or cutesy town) sidewalk seating and a fab brunch menu featuring the Mimosa and Bloody Mary sisters. 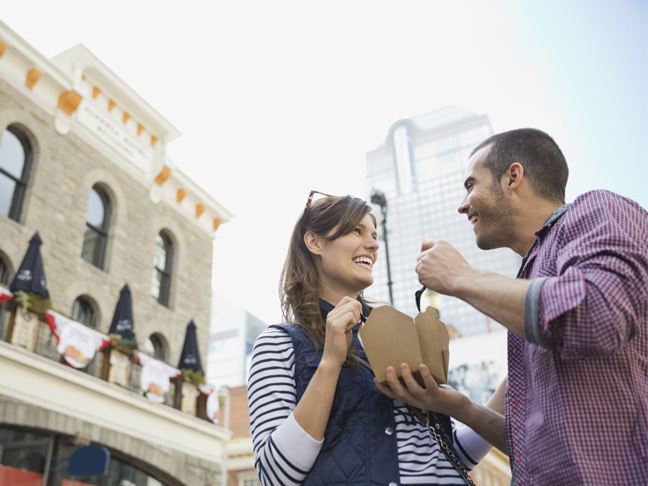 Eating, drinking, and people watching is a fun way to connect. And since you’re on a sidewalk, after the meal you can walk it off and window shop. Ball Game. Casual clothes and a loud, vibrant crowd makes for a fun date (and it takes the pressure off if it’s a first date). And who doesn’t love park food — beer, popcorn, soft pretzels and hot dogs? You don’t have to break the bank and go to a MLB game either. The Minors and college games are just as fun. Botanical Garden. What’s more romantic than walking around a maze of gorgeous flowers and plants with someone you love — or with someone on a first date? I say, not much else. Pack some chocolate-covered cherries to enjoy while you take in the cherry blossoms, of course! Classic Drinks & Dinner with a Twist. A cocktail and a meal is a tried-and-true idea for a first date. But instead of meeting at the bar for a cocktail, suggest a rooftop bar with a view or a sweet courtyard lit up by entangled twinkling lights. The fresh air, dark sky and crisp cocktails are the perfect prerequisite for dinner. As for dinner: Keep it fresh and light: Think cheese boards, Tapas, or sushi. What are your fave spring date ideas?